You'll need to create two new calculated columns: one to give the year of each transaction, and one to give the amount (price times quantity). The tables you'll need to import are tblAnimal, tblProduct, tblStore, tblTransaction, tblSpecies and tblPos. The reptile total for Arndale Centre - store A is 0.12% of the grand total, for example. Select all of the species in the horizontal slicer, and scroll down to check that the grand total is now 100% for all stores, years and species (it should be). 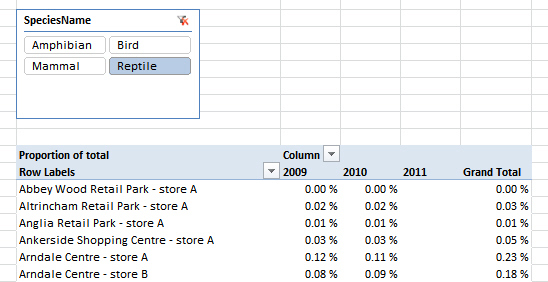 Save this workbook as Clever PowerPivot, then close it down.